MINIZOOM-395 is the best focusable UV black light flash light on the market. Incredibly strong design that makes taking your UV energy to new places easy. 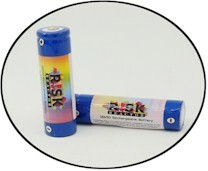 This UV Flash Light Kit comes complete with one double AA battery ready to use. Kit also comes with a MAR-C0 Invisible Fluorescent black light blue pen. Now you can use the pen to mark your property, and secure your future. There are countless compounds that glow under black light including minerals, plants, fungi and microbes. Other organic and inorganic substances fluoresce as well and when then do it is an amazing effect to say the least. Fluorescent materials can absorb UV radiation which is invisible to the human eye, and then emit it in the visible spectrum. The absorption of this UV energy causes electrons in the compound to jump to a higher energy levels and when they fall back, then emit a photon of light. These electrons cannot stay in the higher level because they are unstable making the return to a lower energy level a continuous operation as long as the black light is on it. Some substances used as pigments in paints or dyes that exhibit fluorescence attributes making things appear brighter under sunlight. Sunlight has black light in it and they absorb invisible UV light part of the visible light and re-emit it at visible light. This particular characteristic is the reason they are commonly used for safety signs, safety vests and other applications in which high visibility is important and or necessary. Animals see in UV which gives fisherman an edge as well as birds and bees. Risk Reactor Inc. is dedicated to innovating the superior black lights for finding Scorpions. Being in a desert environment, we understand what makes scorpions fluoresce. The battle between home owners and the arachnid invasion is ongoing. Protect yourself from these poisonous and dangerous arachnids. Scorpions have been on Earth almost since the beginning, well documented in the fossil record. Man has been battling to keep his environment safe and now we finally can. Use any of our 395 NM black lights with the BMONSTER-395 being the most powerful UV Scorpion Light on the market. Sure there are cheap ones but if you want a lot of energy in a quality casing, use our blue monster BMONSTER-395. When you can find the scorpions you can remove them before they cause any problems, especially for young children and pets. Scorpions tend to come out at night which is a defensive mechanism. The arachnids think they cannot be seen under the darkness and are therefore safe to scavenge for resources. Since the cuticle of the Scorpions glow under Risk Reactor Inc.’s black lights they now can be spotted first. Scorpion also reproduce fast so frequent checking is important to safely be rid of the pest. MINIZOOM-395 Black Light UV Batteries. BMONSTER-395 STRONGEST 395 nm light for its size. THIS IS THE MASTER SCORPION hunter for sure.